WAIST HIGH: Happy 25th Birthday Upstairs At Eric's. Happy 25th Birthday Upstairs At Eric's. Released 25 years ago this month, Upstairs at Eric's reached #2 in the UK and has been hailed as a landmark synth pop release; a record that established the link between American-style R&B and European electronica. 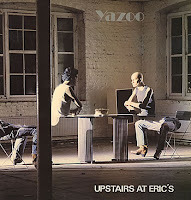 Named after the duo's living space in producer Eric Radcliffe's home during the recording, Upstairs at Eric's contains the three classic singles "Don't Go," "Situation," and "Only You." Departing Depeche Mode after their first album Speak and Spell, Vince Clarke formed Yazoo in 1981 with Alison Moyet, a veteran of a number of southeast Essex based punk and rock bands. Their second and final album You and Me Both went to #1 in the UK, however on the eve of the album's UK release, Clarke and Moyet announced their split. "Upstairs at Eric's is a true classic of not only the 80's synth-pop movement but also, without exaggeration, of 20th century music. On the one side is the genius of Vince Clarke on the synthesizers and on the other side, the beautiful, unmatched powerful voice of Alison Moyet. They were together for only two albums but they attained immortality with these. Every song in this album is a work of genius. Arrangements are first class. This is a once in a lifetime performance." "The FINEST piece of electronic pop music to come out of the Eighties."